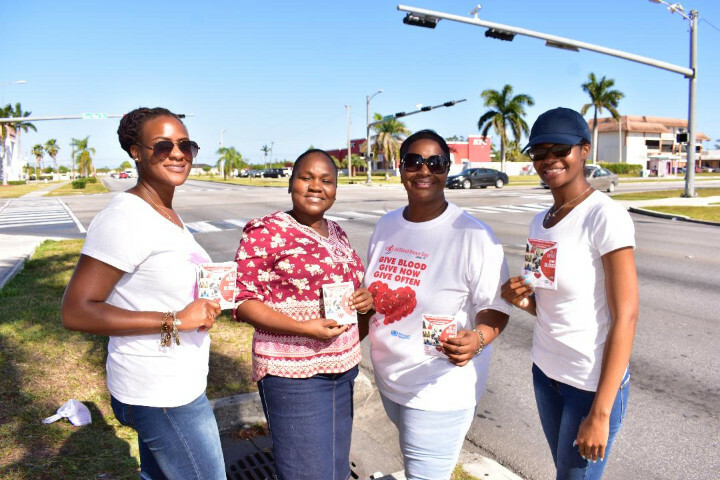 The Blood Donors Society of Grand Bahama was back on the streets on the weekend spreading the word about the blood drive set for Friday, April 27 at the Rand Memorial Hospital. From left are Rhashida Curry; Adrianna Gordon, secretary; Lededra Marche, president, and Rhashanna Curry. Freeport, BAHAMAS– Pumped up for its first blood drive for the year, the Blood Donors Society of Grand Bahama (BDSGB) is back on the road to promote its “Gift of Life” Campaign set for Friday, April 27th. “We want to make it a fun event and even have some treats for those come out and donate on Friday,” BDSGB President Lededra Marche said at a press conference Wednesday at the Sir Charles Hayward Library Conference Room. The goal is to host a blood drive every quarter – in April, August and December. “We want to get it in the residents’ psyche that it is something they can do on a regular basis. 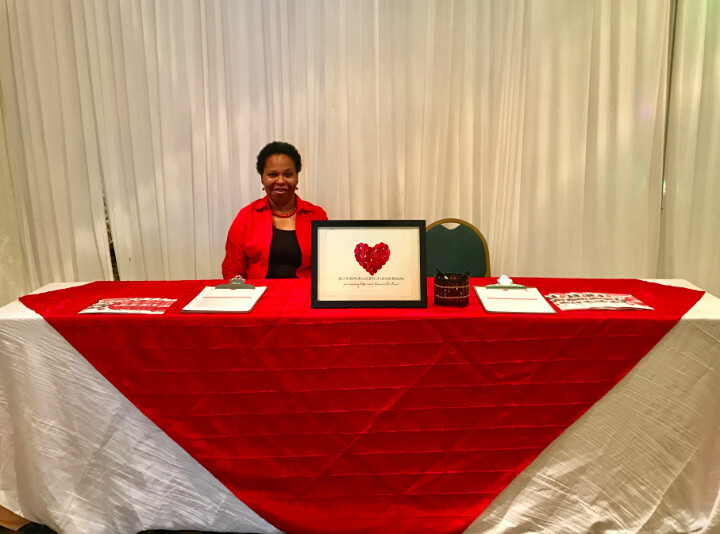 We are also hoping to have Corporate Grand Bahama come onboard where their employees can be rostered throughout the year; that way there will be a steady influx of blood streaming into the blood bank at the Rand Memorial Hospital, along with an abundance of volunteer donors,” she said. 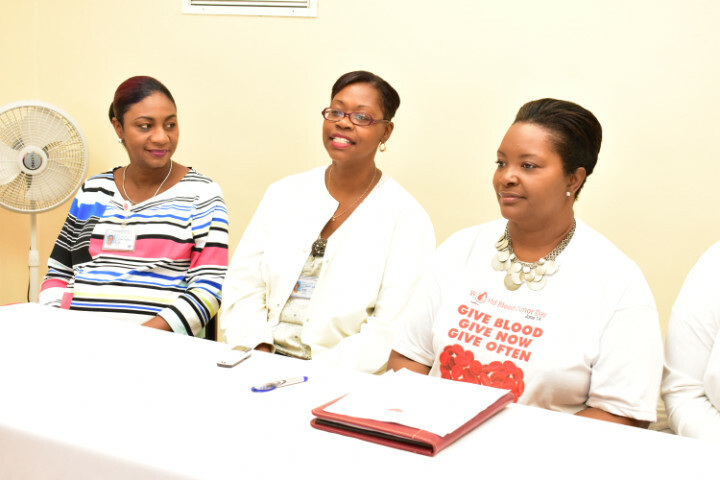 The Blood Donors Society of Grand Bahama is gearing up for the Give the Gift of Life Blood Drive on Friday and told residents how to prepare for the much-anticipated event at a press conference Wednesday at the Sir Charles Hayward Library Conference Room. From left are Bonnie Stubbs, assistant secretary; Claudia Glinton, treasurer; and Lededra Marche, president. However, Marche points out, residents aren’t only subjected to those times of the year. “Anyone can visit the lab to give blood, as well as make plans on World Blood Donor Day which is celebrated annually on June 14th,” she said. The BDSGB has partnered with the Grand Bahama Health Services and the Bahamas Red Cross Grand Bahama Centre to sensitize the Grand Bahama community on the selfless act of giving blood and the importance of a Volunteer Blood Donor Registry. The University of The Bahamas Alumni Association, Grand Bahama, has also joined in to support the drive on April 27th and is expected to be out in large numbers. “Additionally, we are also grateful to those civic organizations who have partnered with us, namely the Grand Bahama Alumnae Chapter of the Delta Sigma Theta Sorority, Inc., the Fabulous Wives and more recently the Kappa Lambda Lambda Chapter, Omega Psi Phi Fraternity, Inc.,” Marche said. Last year, sponsors such as Subway Restaurants, Western Bakery and Restaurant, Coca Cola, Millennial Designs & Printing, Total Media Bahamas, The Jeanie Express Courier Services, Imagine Graphics & Printing, Trinity Fashion, Office Plus, Kelly's, FOCOL and all of the radio stations came onboard. A number of them have returned and a few others, such as Syngad Services, KOSHA, Morgan’s Pumping and Drilling, The Awards & Signs Centre and Bethel’s Superstore, Bellevue Business Depot and other private individuals have said yes to supporting a lifesaving cause. 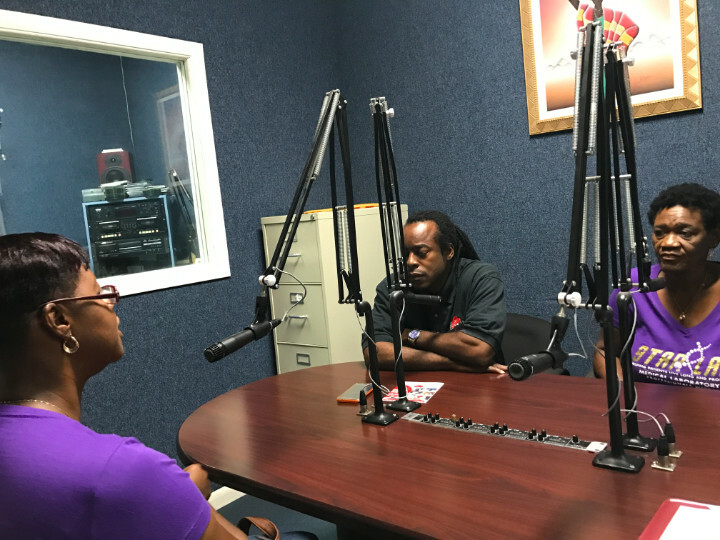 Leaving no stone unturned, members of the Blood Donors Society of Grand Bahama set up shop at the To Have and To Hold 2018 Bridal Show last weekend and stopped at a few radio stations leading up to the big day to get the word out about the blood drive on Friday.